the Carrera GT is the newest addition to the 911 lineup. With a little more than a year before the arrival of a brand-new model, Porsche AG has revealed yet another version of the existing 911, the Carrera GTS, in both coupe and cabriolet body styles. Set to underpin the German sports-car maker's stand at the Paris auto show, the newest addition to the 911 lineup receives a revised version of the 3.8-liter horizontally opposed six-cylinder boxer engine found in the Carrera S. It has a sports exhaust system and a long list of standard features -- all aimed at ramping up the appeal of today's 911 in the face of stiff supercar competition from the Audi R8 and the Aston Martin Vantage. With 408 hp, the rear-wheel-drive Carrera GTS packs 23 hp more than the 385 hp Carrera S. Peak torque remains the same at 310 lb-ft but is developed 200 rpm lower in the range, at 4,200 rpm. The Carrera GTS comes standard with a six-speed manual gearbox, but customers can also specify Porsche's seven-speed PDK dual-clutch as an option. The car can hit 62 mph in 4.2 seconds on the way to a top speed 190 mph in coupe guise. 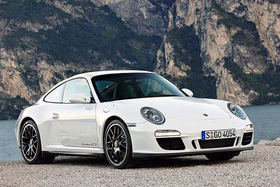 Among the Carrera GTS's standard features are 19-inch center-locking alloy wheels, unique side sills and a rear valance panel finished in black. Inside, there are sport seats, unique black Alcantara trim and a three-spoke sport steering wheel.